The continuing controversy surrounding the sinking of Cunard's Lusitania. The sinking in May 1915 of Cunard's Lusitania, an unarmed passenger liner en route from New York to Liverpool, stunned the world and decisively turned global opinion against Germany. But Germany protested that the sinking, which resulted in the deaths of over 1,000 innocent passengers and crew, was justified because Lusitania was covertly carrying contraband in the form of American munitions for the British war effort. She was, therefore, a legitimate casualty of war. However, there were many unanswered questions about Lusitania's fate, and most notably the role of the British government. The sinking was engineered by the British, it was claimed, to draw neutral America into the war on the side of the Allies in a plot devised by the First Lord of the Admiralty, Winston Churchill. And why did the Admiralty put such effort into blaming the Captain? Why was the ship not diverted away from a known U boat presence? Were there armaments on board? 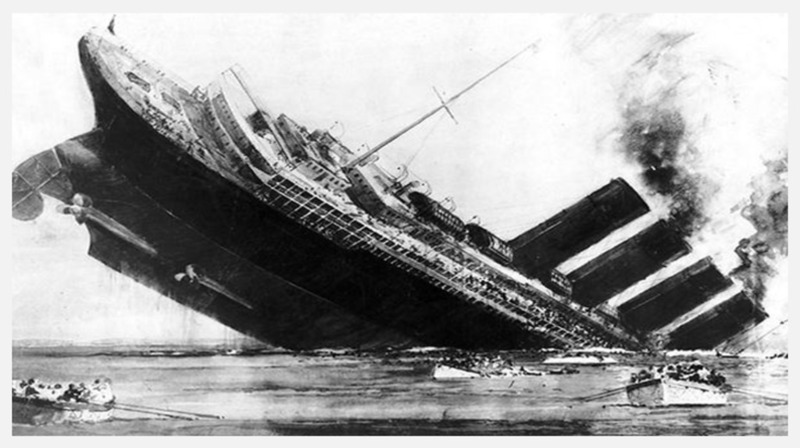 There are many contradictions and deceptions, so much duplicity and deviousness in the Lusitania story it is difficult to determine if she was a casualty of war or a victim of conspiracy. Or was the cause something else altogether?